Difference between revisions of "10338D"
10338D/10338E is a modification of the earlier [] board designed to interface Aptina (before Micron) MT9P031/MT9P001/MT9P006 5MPix (2592x1944) sensor to [[353|Elphel Model 353 Cameras]]. This board has smaller physical size (15mm x 28mm) to fit in multisensor panoramic setups. * 30-pin flex cable connector (J1) for data and power. These boards are compatible with the [] camera system board. 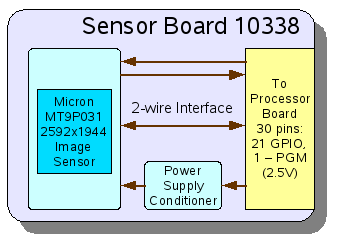 10338D/10338E is a modification of the earlier 10338 board designed to interface Aptina (before Micron) MT9P031/MT9P001/MT9P006 5MPix (2592x1944) sensor to Elphel Model 353 Cameras. 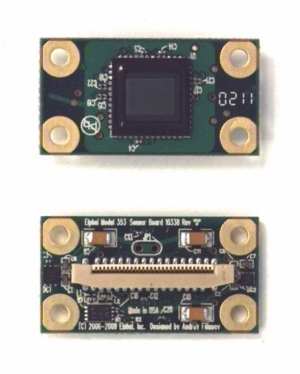 This board has smaller physical size (15mm x 28mm) to fit in multisensor panoramic setups. 30-pin flex cable connector (J1) for data and power. These boards are compatible with the 10393 camera system board. This page was last modified on 15 November 2018, at 16:58.